Chilton's Acadia Live Edge bedroom furniture, shown here in cherry. The cherry is sourced in Maine. WHEN CHILTON FURNITURE changed hands four years ago, nearly three quarters of its furniture was being built outside of Maine. Today, more than half the furniture is made in Maine, and the percentage keeps climbing. Chilton Furniture originated as a 19th century paint company and was once well known for its unfinished pine furniture. More recently it has been known for its Shaker-inspired furniture designs. It has showrooms in Scarborough and in Freeport, just down the road from Thomas E Moser, the granddaddy of Maine furniture makers. This made-in-Maine story is the work of transplants from Westchester County, NY who knew nothing about furniture building when they acquired the company and moved to Maine in 2014. Husband Jared is a portfolio manager. Jen is starting a second career after stints as a Wall Street lawyer and stay-at-home mom. Maine had been a vacation destination for them both; it was also where Jen had spent summers as a child (Ocean Park) and her college years (Bates). A business-for-sale ad caught their eye, and before long, they were the owners of a venerable Maine business. Designed by Peter Thompson, this line of dining furniture features cherry, some of which is grown in Maine. “I knew nothing. Nothing. Other than liking furniture and being a bit compulsive,” Jen said. Jen is animated. As she tells stories about her favorite furniture makers, she moves from room to room in Chilton’s Freeport showroom, touching beds, chairs and tables. The “clean, minimalist” look of Shaker furniture appealed to Jen. She started reading furniture books and meeting furniture builders. She learned the names of different kinds of joinery. She attended a trade show in Indiana, the heart of Amish furniture manufacturing and source of much of Chilton’s furniture. The Levins also have a name to build on. Today, Shaker furniture is so popular, it’s practically a cliché, but Chilton has a decent claim on authenticity. Chilton Furniture and Tappan Chairs in Center Sandwich, NH have developed an exclusive arrangement to produce furniture for United Society of Shakers, the last remaining Shaker community, in New Gloucester. The Levins have become friends with Michael Graham, director at Sabbathday Lake, Brother Arnold and others. The friendship and history buoys Jen whenever she gets discouraged about the learning curve of a new business. “I never lost sight that we had a name,” said Jen. Jen found Maine furniture makers more receptive. “Maine builders are a little more humble,” she said. “They’ll tell me, ‘If you want to try it, I’ll try it.’” She believes the quality is higher, and she values the relationships she is developing with small furniture makers all over the state. “I wanted to be able to come to their shops and talk, get to know the builders and feel like they understood me,” she said. It would be comforting if Maine-made furniture were also Maine-grown wood. But that may be wishful thinking, given the complicated supply chains involved. One example may illustrate this. One of Chilton’s furniture makers is Peter Brown, owner of Meadowlark Designs in Lyman. With a strong interest in sustainability, Brown uses plant-based finishes and buys furniture stock locally from Seacoast Hardwood in Sanford. “The closer to home the better,” he said. But Brown knows that wholesale hardwood lumber comes from all over the US, even the world. “I don’t think there’s a good defensible source trail to guarantee a piece of wood comes from anywhere,” said Brown. The exception is wood certified as sustainably grown by third-party audits, such as the Forest Stewardship Council. Brown says he appreciates Chilton’s new direction. 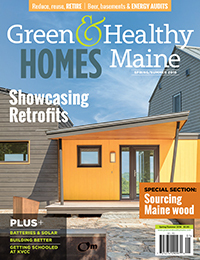 This article was reprinted from a special section on local wood in the spring 2018 issue of Green & Healthy Maine Homes. Subscribe today!